BIG NEWS. We are developing a completely new kind of platform. 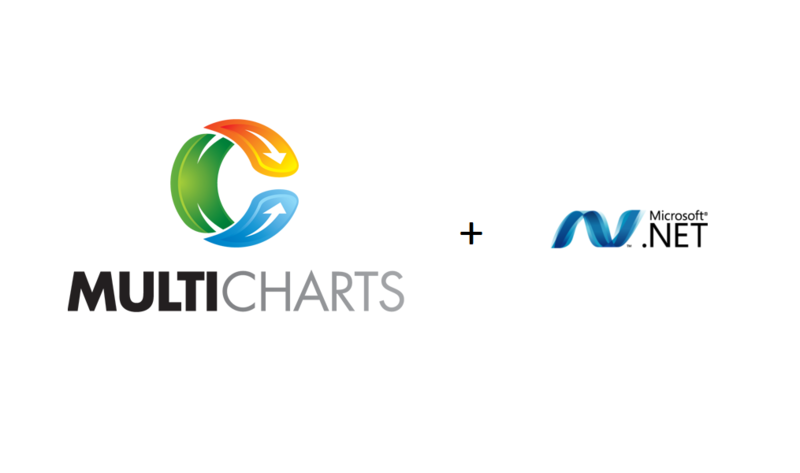 “MultiCharts .NET” will combine the best features of MultiCharts and with the robust capabilities of the .NET framework. Every trader that’s using C#, Visual Basic, Visual Java, or any other language supported by .NET to write indicators and strategies will be able to do so in MultiCharts .NET. The power of a professional programming language, the kind that a proprietary language just can’t deliver, doesn’t need to be explained to people already familiar with programming. As you get into writing sophisticated studies, it becomes more efficient to have a industrial-grade language at your fingertips. MultiCharts has always been about engineering, that means all we focus on is building new things that will be useful to a larger number of traders. We also want your input – what do you want to see in this new version? What should we keep in mind? Any comments, suggestions, or wishes go into the space below. If you want to be considered for closed beta testing, email support@multicharts.com with your request. This entry was posted in .NET, Beta, MultiCharts on April 25, 2012 . Then you might be a good candidate. Pls send your request to the email indicated above. MC Team – Are there any plans to introduce “unmanaged” version of Order handling capability into this .NET version of MC? At present there are lot of limitations with PL based Order handling. If you can allow unmanaged Order handling – it would be a great addition. It would be even better – if you can allow unmanaged version of OCO order as well – for the supported brokers. Yes, we are planning on introducing unmanaged order handling. Very nice. Will Easy Language still be supported in the .Net version? No, MultiCharts will continue supporting EasyLanguage, and MultiCharts .NET will be a separate product that supports the .NET languages. Please give more details about upgrade options from existing Multicharts license. I played with the thought to purchase Multicharts. But now I’m not sure anymore as I would prefer Multicharts .NET. Will you discontinue the normal Multicharts once you have fully implemented all features into the .NET version? MultiCharts will not be discontinued. There will be two separate packages, and you can get the one that you want – or both. Can you give a raw estimate when to expect the first public .NET version of MultiCharts? Closed beta in about 2 weeks, first public should be in about a month. You might even consider doing this with your basic MultiCharts product. In any case, I’m interested in being one of your beta testers. What you are talking about is a whole different “ballgame” so to speak. It has nothing to do with the change of programming language, it’s an entire new feature that would need to be considered separately in the future. Remember to send the request if you haven’t already to be in the beta testing. COM is obsolete in .NET, You will get the much more powerful .Net integration. Supposedly when they document their API’s the whole of multicharts will be available to you by Assembly references. Sounds great! Make sure you submit a request to support@multicharts.com to be included in the closed beta testing. If MultiCharts .NET will not support EasyLanguage, will it be possible to call the EasyLanguage DLL’s into MultiCharts .NET? That way, users don’t have to rewrite their already existing indicators and signals. Perhaps you could even make a “import tool”, that will take those DLL’s and make them a indicator or signal in MultiCharts .NET that calls those DLL’s (if you understand what I mean 🙂 ). Will the MultiCharts processes like MultiCharts.exe, QuoteManager, etc. also be different from the regular MultiCharts, or is “just” the programming capabilities different? Can we use Visual Studio to attach to MultiCharts.exe to do debugging, or comes MultiCharts .NET with build-in debugging tools? Would a purchase of MultiCharts .NET act like a second license, meaning we can run regular MC and MC .NET at the same time, or some kind of “upgrade license”, meaning both cannot be used at the same time? I hope the pricing will also be competitive for retail traders, since it sounds like a product for the professional and institutional traders. Which off course isn’t a bad thing, but the investment in this new product still would have to make sense for retail traders. 🙂 I understand that at this point you can’t give comments regarding the price, but will the pricing be closer to the ‘regular’ MultiCharts life-time license or closer to the MultiCharts PRO license? Let me address your questions in order. – You can call it now, and will be able to there as well. Right now you can call external DLLs from PL script, which can accomplish the same goal. – Not sure what you mean, there’s no such thing as EasyLanguage DLL as far as I know. A DLL is just a DLL, yes you can call that from .NET. – They will still be there, but they will have differences so you can use both products at once. The main functional difference will be the programming language for studies. – You can attach to multicharts.exe with Visual Studio to debug. It’s a big advantage for very complex code, since PL becomes hard to deal with when you have a lot of things happening. – Both can be used at the same time. It’s a license to a separate product – you can buy one or the other, or both. Will Multicharts .NET support Easylanguage Indicators, Strategies, etc. ? Is there a new userinterface with Multicharts .NET ? No, MultiCharts .NET won’t understand EasyLanguage scripts – that will be the job of regular MultiCharts. Essentially, it’s a matter of preference which platform you want to use – EL or .NET version. Choice will depends on your knowledge of programming, long-term goals, etc. Nothing prevents you from using both at the same time, each can be useful for its own purposes. There is no new interface planned for MultiCharts .NET, although there will obviously be differences in the language editor. I would like to suggest to make it possible, or rather make it convenient, to use VisualStudio for code-editing. I have used other products that use .NET as their language, but the intellisense and general editing features are just subpar compared to VS, and its quite annoying if you are used to that. Ideally, as soon as i hit F6 in VS, things should happen in MC. No copying DLls or refreshing charts and so on please..
Also, may i ask, i suppose Multicharts is a native windows applicaiton? Marshalling between managed indictors and unmanaged application sounds like quite a performance hinderance. A certain competing product i have used has this problem.. It won’t be as simple as you describe, but close. You can use VS, but we’ll have our own editor. MultiCharts is a native Windows app. Hindrance will be there, but nothing dramatic. I second to allowing us to use VS! And also would be nice to allow for us to use version control like Mercurial. Will code files be loose .cs files for C# (or .fs files for F# if we prefer that .NET language)? Hopefully database will be more accessible as up to date no split-adjustments for stocks or other measures not supported by the data provider are possible in an acceptable way – will you stick with firebird or move to e.g. for SQL Server 2012? This feature has nothing to do with switching the programming language, it’s separate. You should add a separate feature request in our Project Management system. We will certainly add stock splits in the future. It is an important feature indeed. As in the years before priority was not sufficient to realize an implementation. From my point of view it is not simply switching a programming language but a switch of development framework. I was not aware that there is a Firebird Firebird ADO.NET Data Provider but in case there was none you would have had the task to develop and validate one on your own. So the question whether you stick to firebird should have deserved a simple answer. Splits will be made available at some point in the future. Thanks for your suggestion. We’ll consider adding this in the future, but there won’t be access to the data from SQL at the start. I hope you learnt from their mistake. I hope you will have tick data easily be accessible, no limits on timestamp (ie. up to 1 sec granularity), bid and ask can be stored and referenced easily (ie be able to calculate onbid and onask volumes at any time). I hope you will provide flexible multi-instruments charts and indicator on indicator as it is implemented in Sierra.. Anyway, my message is that – if you could combine best of Sierra with best of Ninja – it is already going to be huge success.. Thanks for the wishes. Not everything can be done in version, unfortunately. We’ll try to make it as flexible as possible in future versions of the program. This is very good news. But I just bought a MC license this month and this will be another license? I think there should be an one-off option to let existing MC license holders convert to this version. Otherwise it is just price gouging. There won’t be any price gouging. What’s being developed is a completely separate product that is programmer-oriented. EasyLanguage/PowerLanguage version will remain as the tool for non-programmers, while the .NET will offer much more powerful capabilities to people with programming experience. We haven’t thought about conversion yet. We’ll follow up with price updates in the next few weeks, so wait and see. Isn’t this a repackaging of the FXCM “Strategy Trader” that was developed by Multicharts (Which was basically MC7 with .net)? It’s fine if you are monitezing your existing investment but not at the expense of existing customers especially those who have just spent $1499 on a license? What’s the point of a “lifetime” license if within a month your product is no longer upgradeable? It’s good you brought up this point. Let me clarify. Strategy Trader was a custom product, with specific requirements, only one of which was the ability to write in C#. It had a number of other interface and procedural changes specific to FXCM’s requests. MC .NET will be much more than that. Support and upgrades for lifetime customers are not going anywhere, don’t worry. We will continue upgrading and releasing new versions with new features of both MultiCharts and MultiCharts .NET. Imagine as if there was only one branch, but now there are two, growing simultaneously. That’s essentially what it is, you’ll have a choice to pick the language you are more comfortable with, or work with both if you want. As a lifetime customer of MultiCharts, you’ve chosen your package and we’ll continue supporting and fulfilling our obligations. All that will be introduced is another option for you to take advantage of, if you want. I’m not a programmer but can work to some degree with Power Language/EZL. Will the .Net version come with some of the cureent MC reserved words/functions already coded or “functioned”? Say something like the existing “MarketIfTouchedOrder” or would that have to be written as an entirely new function? Majority of the functions, and definitely the dependent functions that indicators need, will be present. However, in some cases there are more efficient models in .NET already present, so they may be used. I am not good in EL language and I am not in IT business. However, I guess not many people using multichart autotrade in Asia Market everyday. One function I am looking forward to see is the “Simulated Stop” order like Ninja. Add your suggestion to the Project Management as a feature request, so others can vote on it. This sounds great – although I’m probably not sophisticated enough to be a beta-tester, I will definitely consider purchasing this when it comes out. Any more information you have would be great! A beta-tester is someone who is willing to dedicate the time to thoroughly test new functionality by doing poking around in expected and (better yet) unexpected ways. If you are good at programming in .NET, and you’ve used other trading platforms with such infrastructure in the past, your insight can be helpful. I want to be a beta tester !!!!!! We was dreaming of it !!!!!! without daring asking for it !!!! We will be much more efficient by using .NET directly with MC 64 !!!! It will faster, more accessible, we will access more functions of MC, we will have access directly to database with more data, directly to Indicator as well, and we will be able to fusion our software with MC 64, this will be much more efficient. You are the BEST !!!! Your Team is the BEST IN THE WORLD !!!!!! THANK YOU SO MUCH !!! YOU ARE A DREAM PARTNER FOR SUCCESS !!!!!! I currently use Ninja Trader. In NT I have used C# to create custom buttons on the Chart Trader Panel and to change the appearance and function of the standard buttons. Will I be able to do that in Multicharts.Net? NinjaTrader is written in C#, so the ability to modify program components (like toolbars and buttons) is a logical outcome. MultiCharts is written in C++, so this capability is not readily present. However, we will add important flexibility elements as time goes on. And with time we will provide a way to create custom toolbars and buttons. When the flexibility elements and a way to create custom toolbars and buttons become available, I would be interested in MultiCharts.Net. Check out the latest blog post with GDI DOM example in MC .NET. Sounds great. It will be interesting to see how functional your editor is compared to VS. Is it an IDE? Personally, I always hated VS and found other solutions like Eclipse far easier and simpler to use, yet just as powerful if not more so. Are you using Eclipse by any chance? It has become a very popular IDE for many other solutions in other fields of business and commerce. No, we don’t use Eclipse. We’ll try to make the editor flexible and helpful. I’m very excited and glad to hear about the .Net-version! Will Multicharts .Net just be another language/framework for creating studies or does it also differ in order management, order control, position management etc.? When there are improvements in Multicharts are they implemented in MC.Net at the same time? That means: do both versions only differ in programming studies? Glad to hear you are excited. As mentioned in one of the previous comments, there will be two branches now growing instead of one – MC and MC .NET. MultiCharts with PowerLanguage will carry on as usual, with the same tempo of updates and new features. But for all those that don’t want PowerLanguage for one reason or another, there will be MC .NET, a programmer-oriented program with a .NET interface. The initial studies in .NET will be the same or about the same, and all keywords that you are used to in PL will be there as well. So, the versions will differ in the programming language used, but there will be more differences. In MC. .NET we will eventually introduce flexibility in order handling and open up interface optimization options that are only possible with .NET. These changes will be very beneficial to sophisticated programmers and people writing complex algorithms. Have you sent your application to support@multicharts.com? If not, you should do so to be considered for beta-testing. Although I agree this is a very good addition to MC’s product offerings, I feel you have missed a major opportunity by just going with .NET. There are many more users who use Macs in preference to Windows PCs. I would be one of them if MC was supported on OS X. It’s a shame you couldn’t go down a different path and open up a wealth of other opportunities. One way of doing this is to use a java development environment, such as Eclipse. It even opens up the opportunity to develop portable solutions to work on Android based smartphones and iPhone, which are becoming extremely popular for mobile traders. Another path is the DotGNU portable .NET project. There are others. Oh well, perhaps one step at a time. Don’t get me wrong. I’m very glad you are offering this alternative approach to programming in MC. I will most likely use it as I’m sick and tired of using the PL/EL language. It’s extremely difficult to write complex code in PL. Often it feels like PL has a mind of it’s own, and it causes unnecessary complex issues for developers in so many ways. Sure, PL is good for the very basic and simple work, and we all know that’s what it was designed for in the first place. When it comes to complex trading systems, it’s a nightmare. I have been thinking lately of giving up on MC and moving to say Ninja Trader but now this alternative approach has convinced me to stay and try it out. Good work you guys. Agreed – I’m very interested to see exactly how MC.Net will be implemented and what the advantages will be of using this over PL/EL. One thing I’m wondering about is how/when code is executed – is code executed tick-by-tick or can it be executed under other circumstances? You’ll have the same options as you do now in regular MultiCharts – calculate on every tick, or on a timer. The keyword for the timer is RecalcLastBarAfter(s), and it’s meant for those slow ticking symbols, or whenever you don’t need to recalculate something very long on every tick. Thanks for your input. You raised a couple of points – Mac vs Windows, and Java vs C++ (which we use). Our Mac users can simply create virtual machines, or use cloud services to quickly get going with MC. If this wasn’t available, then maybe writing for Mac may be an argument, but given that a Mac user can easily use Windows soft… it just doesn’t make sense to spend all that time and resources on development of a Mac version. As for Java vs C++ – here’s a short explanation of our reasons of why we chose to go with C++. Your opinion may be different (which is totally fine), but we like C++. Also, mobile users usually just need simple charts and BUY/SELL buttons. I don’t imagine somebody sitting on the bus trying to set up a sophisticated trading strategy or doing backtesting. Our users stay put, or use remote access to their powerful trading stations. It would be much easier to build a separate app for the mobile trading (we’ve taken the first step there with http://www.tradingview.com with free mobile online charting that works on any OS). Arguing whether Java or C++ is better is sort of similar to arguing whether Mac or Windows is better. Some programmers really like one, while others can’t stand it. There are however some objective and subjective differences (we chose C++). Java is a cross-platform framework, their slogan is “write once, run everywhere”. The idea is that you write an application once, and it works about the same on Macs, Windows, and other machines. However, many programmers say “write once, fix everywhere”, because programs often behave differently depending on how an environment supports Java. C++ is an industry-standard and powerful language. Entire Windows is written in C++, and all powerful programs like Excel and MS Office are written in C++. All leading quality programs on Macs are also written in C++. Java is a big-time resource hog, while C++ is leaner. C++ could can run faster than Java (and vice versa) depending on how it’s written. Here is a difference of how languages compile (very basic and rough approx.). C++ tends to be faster (needed for algo trading and backtesting). Purely subjective – Java is not very well suited for professional and well-designed Graphic User Interfaces. It’s possible to make a Java app look crispy and clean, but it takes a lot more work than it’s worth. For example it doesn’t pick up Windows themes, since it’s a cross-platform framework. We feel that C++ is better suited to creating good-looking applications with multi-layered interfaces. Hi, I would like to be a beta tester if possible. I currently use tradestation but am totally unhappy and frustrated with EL. I am fluent in c#/VB/C++/etc. I would probably make the switch to MC.Net if it does what I hope it will. Sure. Just send a request to support@multicharts.com with your contact info. Any news on closed beta starting date? It’s planned in early June, almost there. Adding final touches so that main functionality is intact. I’m also very interested in MC.net. I’m sure that will be a powerfull tool. Before buying it when it will be available, is it possible to get its documentation ? Is it also possible to get the code of some “common” indicators to see how it will work ? I assume that by ‘common ‘ indicators you mean the popular things that are available in MC regular and other platforms. They will be included by default in MC .NET, so you don’t need to worry about that. MC .NET will also have a fully-enabled free 30 day trial, so you can try it out and see everything for yourself. Trial for MC .NET will be separate from the MC trial, so if you tried one for 30 days, you can still try the other one for 30 days as well. Having one trial doesn’t exclude you from trying the other one. Let’s wait! Any date for the official release ? May ? June ? July ? Official? hard to say at the moment. We are yet to launch the alpha within a week, and beta soon after. I expect we’ll see a first public working version after that, depending on how the beta testers like it. What do you except from your beta testers? I would like to help, but I’m not sure to have time to learn and develop with the new API (I presume) in a few weeks? Beta testers need to simply use it, and report anything wrong/non-working that they find. Suggestions are welcome as well. Users should be .NET programmers, since that’s the target audience. You are not required to spend x hours per day, nor do you need to learn any APIs. You’ll need to try creating strategies and indicators, and using them in the program. Can you tell us if MC.Net can run on the same computer than MC ? Or will it be necessary to run each of them on their own machine ? MC .NET will be able to run on the same computer as MultiCharts, at the same time. In fact, it’s a good idea to do that, since each will be good for its own uses. Will they share the same Quote Manager instance ? What will the debugger be like in MC.NET? You can use Visual Studio or other editing tools, and use the debuggers they provide. in the .net version will we be ableto create custom drawing tools? I have asked for feature in regular version of MC. Currently I use Dynamic Gann Lines (Fan) which is accomplished using an indicator and putting text on a chart it locates. It’s clunky, but it works. Also will I be able to plot to more than one subgraph at a time. If not, then being able to hvae indicator on indicator would allow me to do the same thing, without the need for something line global variables. PowerLanguage in MultiCharts regular version already knows how to pick up mouse clicks and expert commentary. I think you have everything you need there, but correct me if I’m wrong. You won’t be able to plot more than one subgraph at a time, or have an indicator on an indicator. When will it be possible to purchase and to try the MC.net software? Beta is expected, once again, within a week or so. Then you can try it in beta, and purchase. We are yet to launch the alpha within a week, and beta soon after. Beta is expected, once again, within a week or so. Tightening up loose ends, help, etc. Late this week, or early next week. Will the beta be here sometime this week, or has the release date been moved? Is there any documentation available pre-beta to allow familiarization with how one can create MC.net indicators and strategies? MC8 release is planned today, and then the MC .NET beta. Thanks. Will MC.net be out before the end of this month? It’s in closed beta as of today. We expect it to be public within a month. I need to be able to minimize hedge orders across strategies. The platform must be aware of multiple order requests from different strategy events. This is the equivalent of executing multiple “Interactive Brokers combo” orders. A portfolio margin based account will generally need to have a hedge position for every order placed. We want to accumulate a position in EMC with a hedge order against a broad market ETF. A few days later we now want to close our EMC position completely and open a position in NTAP simultaneously. The NTAP order will require a hedge position in SPY also. Now the problem here is that we really didnt need to make any change in the SPY position, but this is how we have to synchronize it currently in a pair strategy today. It would be great if MC.net could be smart enough to know how many open positions of a hedge position to have across multiple instruments without having to issue dozens or even hundreds of buy and sell orders against our hedging instruments. MC .NET will be different in the keywords and the type of data you can access. But from what I can see, you have everything you need in PL already. Just check “Strategy Position At Broker” for different symbols, and if it’s short already, don’t touch it. Also, this question better belongs on the forum than in a blog comment. Can you give us your opinion about choosing C++ or C# for programming in MC.NET ? I have absolutely no experience of .NET nor programming under Windows environment. I am familiar mostly with C, Perl under Unix, so it seems logical to go to C++ or C# for me. For what I have understood on few websites, it is often stated that C++ produces faster code but C# is easier, faster to learn and has more libraries. Both seems to be well integrated in .NET, so I suppose they both have the same .NET libraries. And for the speed, as they are both executed though the .NET CLR, I do not really see why C++ would be faster. I tend to go more to C++ because MC is already written in C++, but may be this not really a good reason vs C#. Can you give us your advice about choosing one or another regarding speed and librairies, for developing indicators/functions ? MC.Net sould not let behind this high level of productivity. For sure, MC.Net will extent the programming abilities of MC, but this should be done without losing the productivity offered by EL functions. In my view, MC.Net should be a “superset” of MC. Everything that can be done in a flash with EL/MC should be as well easely feasable with MC.Net. Managed code has inherent vulnerability of reverse engineering so developers try to obfuscate the code as much as possible or combine with unmanaged dlls. If one decides to sell their assembly function such as indicators or trading systems is there any way that can be embedded to MC .net and make it hard to crack the code? Or do you have any plans to have any kind of copyright protection for developers of such functions? Many successful trading platforms have third party add-ons and I would like to see MC .net grow together with the outside vendors. Good questions. It’s true, managed code is less protected than compiled binary, but here’s some discussion about actual feasibility of “reverse-engineering” strategies and indicators in practice – http://www.elitetrader.com/vb/showthread.php?s=35f4629f99ccd6539807ca59866e7665&threadid=245028&perpage=6&pagenumber=1. There are some good posts, essentially highlighting how incredibly difficult (if not impossible) it is to actually achieve. We do already have an Add-ons secton in regular MultiCharts, where already compiled indicators and strategies are shipped with MultiCharts. It’s quite possible that we’ll have a similar setup with MC .NET. Hi, I’m System Architect, with 10+ years of experience, worked for many banking & finance organizations, treading firms. Especially with Quant and HFT. Would be interested to learn and test your system. let me know on nilayparikh at gmail dot com. Great! The product should be available publicly in a couple of weeks, so you can test it no problem.